We started this blog as an experiment. I was expecting this to just a writing assignment but it turned out to be more than that. I like the blog assignment because it helps me keep up with some of the concepts we learn in class and apply them to my own interactions with the Web (apparently you capitalize the Web). For example, I was a Pinterest addict. When I first started using it I knew something was different about it, yet I couldn’t quite put my finger on it. Of course Pinterest could be analyzed in relation to almost any topic we covered in class this year. I chose to examine it as an information retrieval system. Not only am I more critical of what a website has to offer (is it Web 2.0? is it Web 3.0 yet?!) but I am also equipped with a better vocabulary to discuss it. Similarly, writing this blog encouraged me to try out new tools and give them a test run. I learned how to use Altmetric, Wordle, Voyant Tools, TAGS, and more. Many of these are in their first stages of production. The developers from Old Bailey Online were particularly excited to hear the feedback from our class. I’m not so sure I will be continuing on for a PhD in the future (probably not ever) or will need to use these tools in the work place, but I’m sure they will be helpful when I’m conducting my thesis research. Again I feel like I have developed stronger analytical skills. I’m not going to kid myself, I have not gained any computer engineering skills in this course. Instead we gained the ability to ‘see’ websites and consider how they are organized. We can’t build websites but we sure can comment on them. I found this class important and relevant because the future is online. Text and data mining are here to stay because of the shear volume of information made available on the web. I would have liked to have learned more about the semantic web because that’s another development of the Web that’s still in progress. I think I have gained relevant skills to be able to participate in the next fundamental change in the way information is structured online. When I hear the phrase ‘word cloud’ a memory from the HBO show Weeds surfaces in my mind (Season 6, Episode 12). The anti-hero, Nancy, is threatened by an under cover journalist getting dangerously close to the truth. Nancy scoffs when presented with a word cloud, but is then on her guard when she hears that the top 5 adjectives for her son, Shane, have aided the journalist to correctly guess that Shane is Pilar’s murder! Drama! While wildly entertaining, this is a scene of pure fiction. I doubt word clouds will be protocol for investigating anytime soon. I also go on to doubt that word clouds will be used in serious academic writing either. New York Times journalist, Jacob Harris, considers the tool to be “the crudest sorts of textual analysis” for simply using size to indicate frequency of words used. Strong opinion considering this is coming from a guy who specializes in data journalism. On the other hand, author Julie Meloni would say the Wordle tool is simple and useful. Her evidence though is firmly based in literary examples. Creating a word cloud is appropriate for single pieces of text like poems, novels, or speeches because you are often looking for themes or patterns of rhetoric. 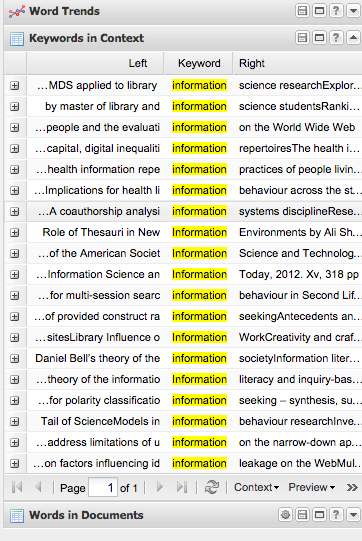 Textual analysis in an academic setting is meant to search large amounts of texts not just one. I experimented with make a word cloud of my own. First, I used Altmetric to gather articles from David Bawden’s suggested journals (listed at the end) to use in our RECS assignment all published in the last 6 months. I exported the data into a .csv file and opened in excel. 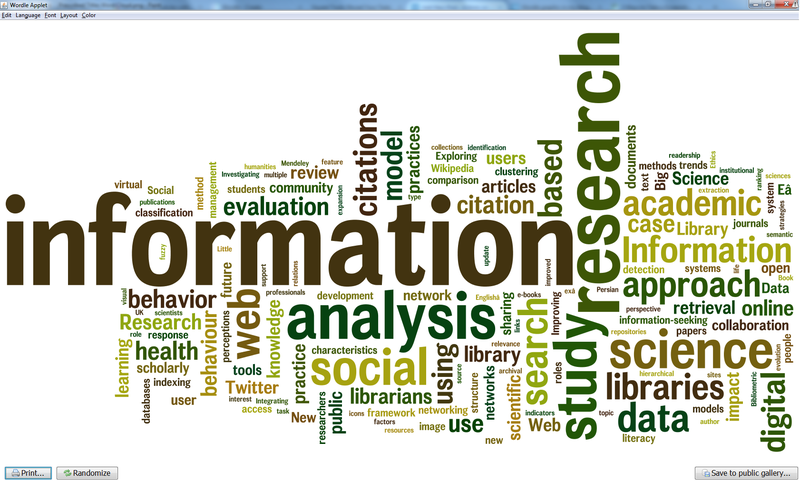 Next, I simply copy and pasted all the titles into the Wordle text box. I noticed that Wordle automatically uses stop words (common words that don’t mean anything by themselves, like conjunctions or prepositions). A convenient feature, but it doesn’t have anyway for you to customize the stop words. The only alterations the user can make are superficial, things like layout, font and color. This website is a great tool for visualization, but not such a great tool for analysis. Another website Voyant-tools.org also includes a visualization of your text along with a wide variety of useful statistical tools. I’ll also mention that if you hover a word in the word cloud with your cursor then the number of times that word is used will appear. I’ll admit that I probably wouldn’t use the frequency chart very often even though it looks very analytical. Let’s just say it doesn’t speak to me. However I would use the ‘key word in context’ tool. This tool will list out the sentence a selected word originated in, thus eliminating the problem of separating signifiers from what they signify Harris described. In a very brief conclusion, Voyant has much more to offer than simple Wordle.